Spread the white bread with the peanut butter. Spread the whole wheat bread with the jelly and place the two slices together with the filling inside. Cut the sandwich into quarters. Turn over 2 quarters and place them back together on plate to resemble a checkerboard. 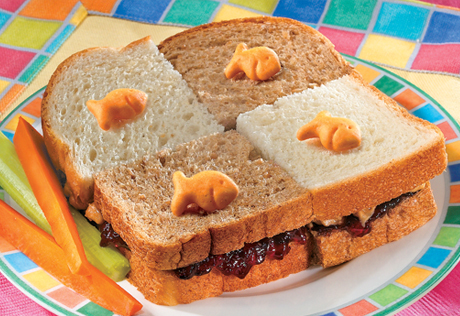 Top each quarter with 1 Goldfish® Cracker.